Excuse the giant pictures. I'm still extremely pissed at Google for taking away my easy collage option, and forcing me in at the deep end. I loved picnic because it was so easy, just dragging and dropping from my Flickr photostream into lovely collages, but for now Mosaic Maker will have to do. I was going to do a day at a time, but I got impatient, boo. 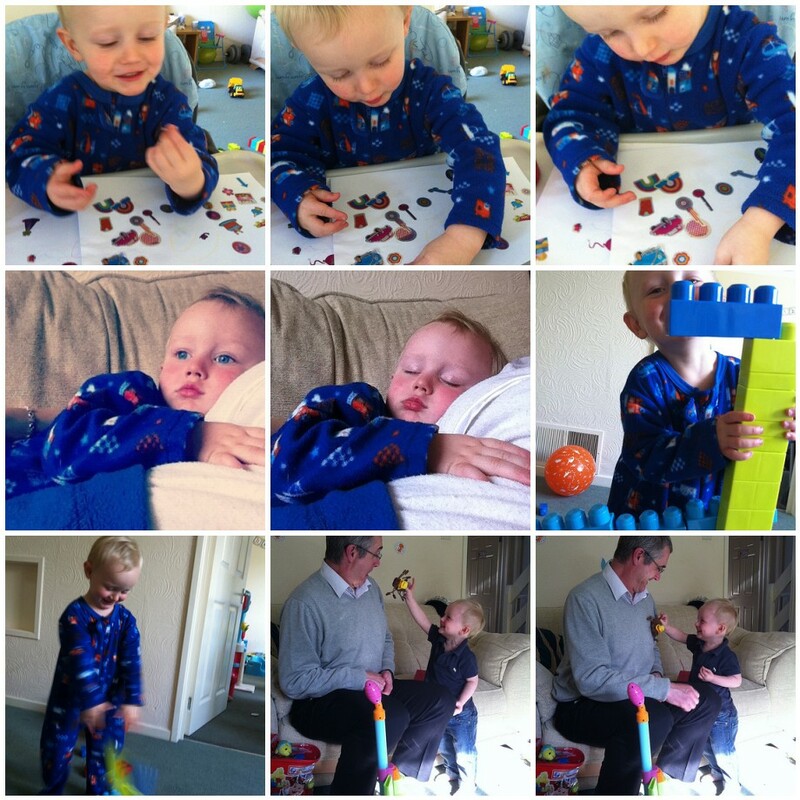 Monday, we had a lazy pyjama day before I had to go back to work. Stickers, snuggles, and building towers were on the menu. Daniel actually fell asleep on me and it was the most adorable thing ever! He ran up for a snuggle when next door started drilling, and next thing I knew he was out! It broke my heart but I had to wake him, there was no way he was going to sleep properly there, but he had a strop and demanded to watch the end of Cars. Boys. Grandad popped over and got attacked by a spider, and Daniel started up shop with another birthday present. Tuesday, I was proud of my achievement to stay on the sofa the whole afternoon, while still playing. We did lots of puzzles, practiced our letter sounds and read books. Wednesday, we went for a long walk in the rain, splashed in zillions of puddles & ended up at Grandma's house, where Daniel got to play with funny Lewis. Then we went to Nanny and Grandad's for dinner, and Daniel cozied up in their bed. Thursday, I forgot cupcakes were messy, we played in the garden and got cheeky during a bath. Friday, I apparantly didn't take any pictures, except that Daddy snuggles one, but I'm too tired to check that now! Saturday, Daniel and I chilled out while Daddy took Milo to the vets for a check up, and after that we went on a family trip to Toys'R'Us. Colin got his birthday present early (an iPad! ), because I'm the best basically. More tower building, and looking very proud of them, and half naked story reading (after running around and around the house for 30 minutes, crazy boy!). Sunday, Mater joined us for breakfast while Daddy went to play golf, and we scooted to Grandad's to build more towers and rock out. Linking up with Amy at a good life, duh. Right now though, I'm SO uncomfortable, so I think I'll grab some chocolate and go lie in bed!! Colin's bending my ear with car talk & the football's on, so it's looking very appealing!